The Artist’s Way is a bestseller first published in 1992, organized as a course of study with a step-by-step, guided curriculum. 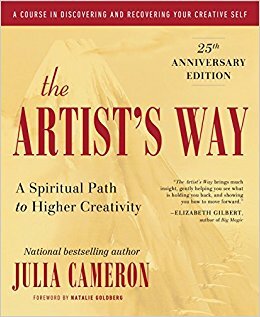 The author, Julia Cameron, taught “spiritual workshops aimed at freeing people’s creativity” for a decade before she released the book, which grew from the course packet that was passed around in global artists’ circles. The Artist’s Way is organized into 12 weeks, each focused on a different aspect of “creative recovery.” (Note that Cameron was a recovering alcoholic when she began teaching.) One week is about learning to feel safe, for example, another about finding creative identity, and another on working out mental blocks around creativity and money, etc., etc. You don’t have to be a suffering artist. You are enough to do the creative work you secretly dream of. A lot of the curriculum asks you delve into your beliefs about creativity, and rebuild the way you think about your creative work. This book leans into the concept of writing morning pages—it’s one of the requirements of the program that you commit to when you sign a “creative contract” at the beginning of the book. If you want to give daily journaling a try but don’t know how to approach it, this book is a great place to start. Another requirement is the “artist date,” which I will let you discover on your own! But it’s the best kind of homework. With weekly reading and daily writing activities, it all adds up to quite a lot of work to do—at least an hour per day while working through the curriculum. For that reason, it’s a big commitment, but if you’re desperate, like I was, it’s worth it. That’s a funny thing about this book. It feels like people tend to adore it or just feel kind of lukewarm about it. I think that if you are deeply creatively blocked and actually ready to make a change, you’ll latch onto this thing like a liferaft. But, if you’re just toying with the idea of doing something more creative (but it doesn’t feel like it’s eating away at your soul), then you might find The Artist’s Way a bit extra. To illustrate: It’s a very spiritual book, with frequent references to a divine creator—although you don’t have to be a religious person to take advantage (I’m not), just open-minded (I aim to be). That said, this is something anyone can do—with an hour a day, you could do this during a commute, in the morning, or just before bed. You don’t need to be a career creator with no financial obligations to feel transformed by this book. A lot of books on creativity I’ve read come from a privileged worldview that is pretty far from reality for most people (i.e., just quit your job, live off your savings, and stop letting your fears hold you back, nevermind that if you don’t make rent this notebook will be all you have left!). I like that The Artist’s Way gives you permission to spend time being “unproductive” on creative work, and even challenges your beliefs about what’s possible in your life—without suggesting your creative journey will be a frolic through the flowers, or offering strategies that are only available to a select few. You haven’t created anything in years. You wonder if you deserve to do the work you dream of. You’re sometimes overcome with acute jealousy or longing to do some kind of art you’ve barred yourself from, or that your life circumstances have made nearly impossible. You worry you’re not talented enough. You assume it’s too late for you. You’re desperate to do some kind of creative work but have no idea how to start. You think that since artists don’t make a lot of money, you’ll never be able to go down that path. I read The Artist’s Way a couple months after moving to NYC. I’d moved here for a job, but secretly wondered if I could find my way into another identity once I got here. I saw people I knew chasing after pie-in-the-sky dreams, and others not thinking they were ridiculous. It got me wondering, and I started writing each day and playing music again—but I still felt like an imposter. Further, despite having a great job, I had lingering terror about the financial security I’d experienced growing up, and hadn’t allowed myself to spend time on work I didn’t think I could earn real money doing. It felt like tempting fate. When I started this book, I didn’t mind the overt spirituality—I was willing to try practically anything if I could start doing work I felt called to do (I’ll let you decide if that calling comes from ego or the Great Creator!). If you have a needling desire to do some kind of work, suppressing it out of fear won’t work. You’ll never stop wanting that thing—so just give in and start pursuing it now. Has someone recommended you read The Artist’s Way? 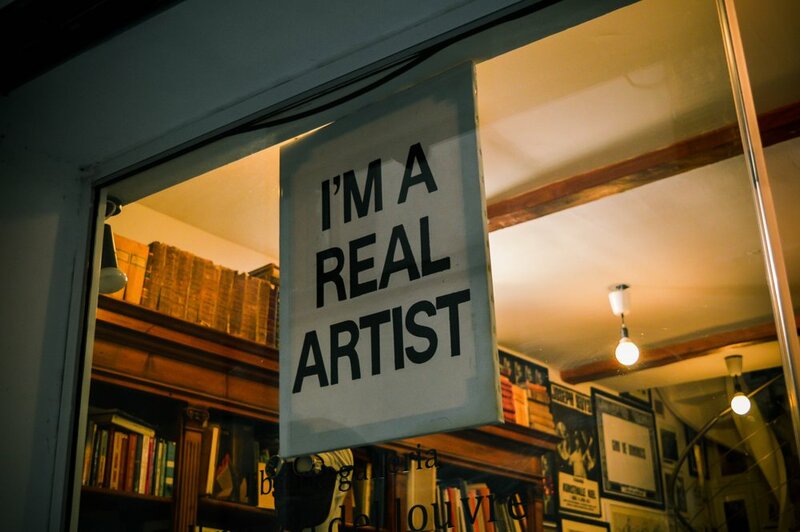 Have you read and/or worked through The Artist’s Way?